If Bethlehem is Las Vegas for believers then Jerusalem is believers' Disneyland. I couldn't quite put my finger on it for a while, couldn't decide what I thought of it, but that's what comes to my mind now when I think of "Jerusalem, that home of rectitude and certainty" (Christopher Hitchens). However, to dismiss Jerusalem on such grounds would certainly be wrong. There's so much history there and it's such an exotic place, that it's definitely worth visiting. In this gallery I will present my personal point of view and my impressions of 'salem. 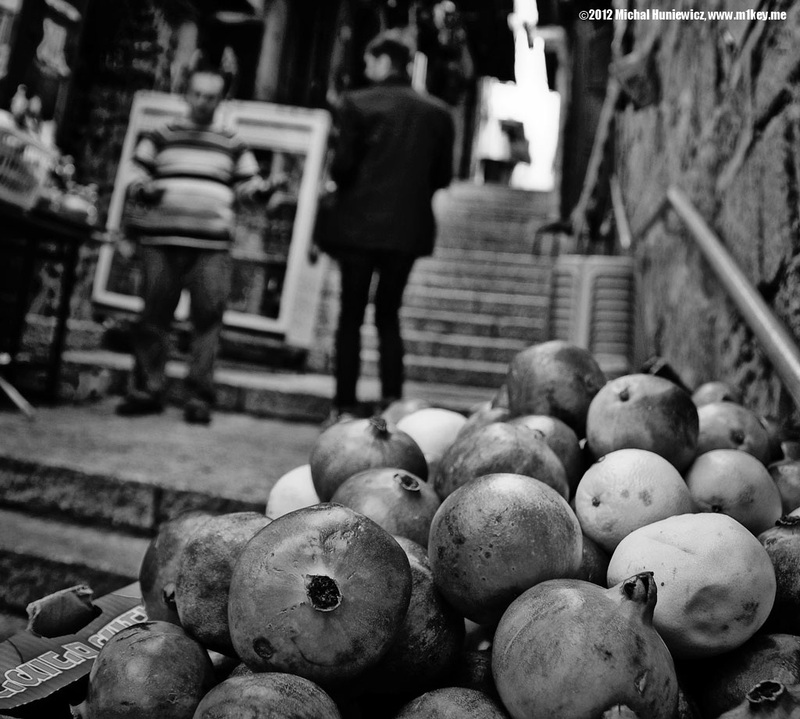 For more pictures and facts (and less opinions), see my other gallery called Jerusalem - the City. It's a good idea to read the descriptions there before reading these in this gallery, as here I don't introduce you to the city as much. 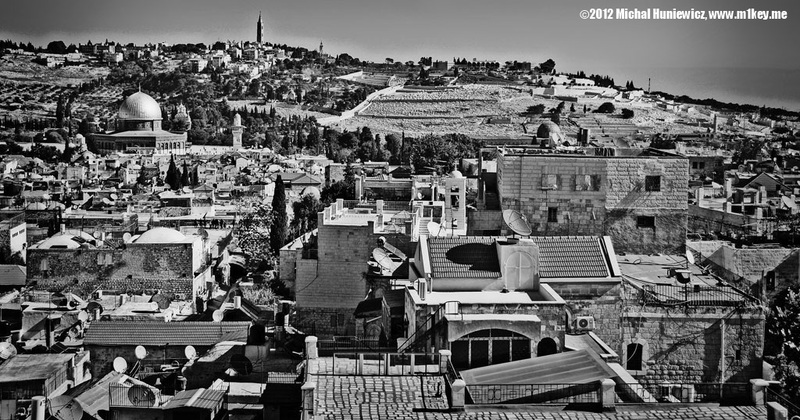 I took this picture on the roofs of the Old City. 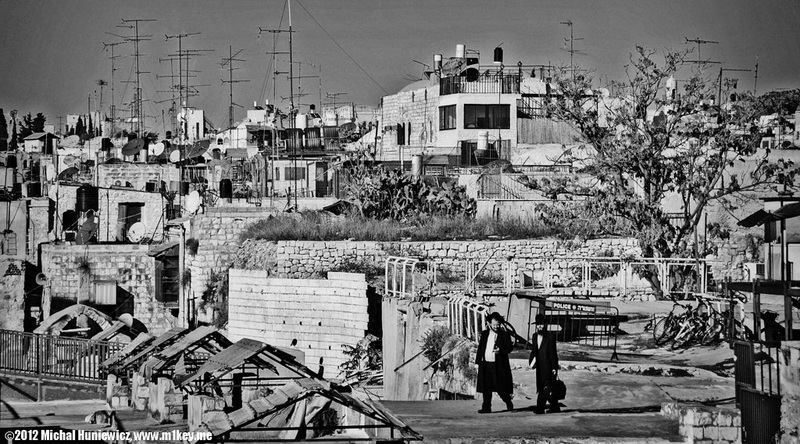 Many people want to live in the Old City but there's just not enough room, so they build compounds on the roofs, often surrounded by barbed wire and guarded by armed men. They are mostly Jewish. The guards didn't look very pleasant but I imagine they're not dangerous if you leave them alone. This is also on the roofs. Orthodox Jewish boys are playing with chickens. One of the things that bother me about Judaism (and Islam) is that they insist on barbaric and painful methods of slaughtering animals. Most countries require stunning animals before slaughtering them - but you don't have to if you want them to suffer for religious reasons. It is only Sweden, Iceland, Switzerland, and Norway that legally require a more humane treatment. Most of the Old City looks like this - it's full of shops. This particular one was nice as it was selling fruits, also to the locals (as opposed to the somewhat less authentic stalls targeted solely at the tourists). 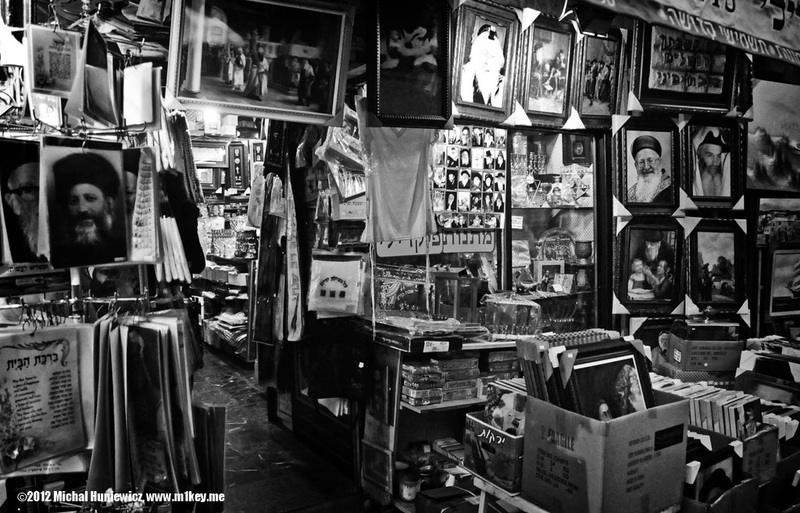 But the omnipresent souvenir shops annoyed me; besides, all those markets in the Middle East are pretty much the same. To be fair, apparently it's been like that in Jerusalem for a very long time (so it's not like some authenticity is lost). 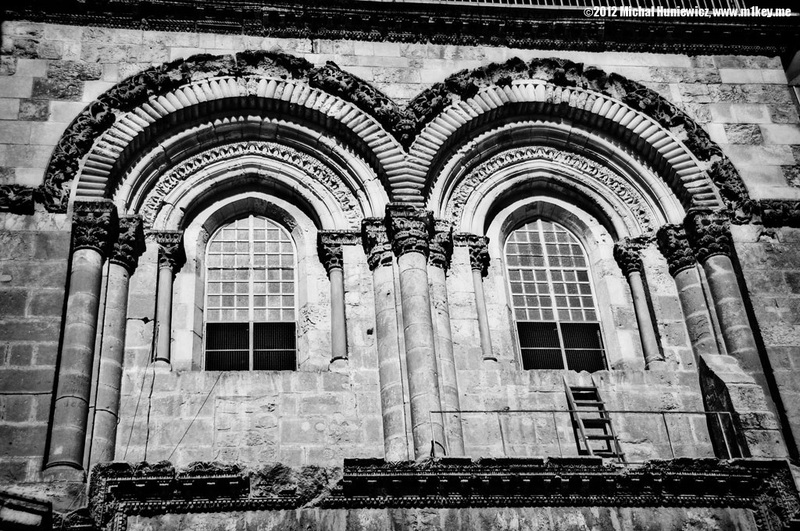 This is the Holy Sepulchre where Jesus was crucified, according to some Christians. Can you see the ladder? Every guide in Jerusalem will tell you about it. One heck of a ladder - it's been there in the exact same spot for a very long time, as it was put there in 1852 or even earlier. No one can move it because the fragile status quo that is supposed to prevent bloody fights between different Christian denominations prohibits changing anything located in the common ground of the church. Christian sects can therefore only change the part of the church they own (the least powerful denomination has no rights to the church and they reside on the roof). And so, the useless ladder has to stay. Violence, of course, does take place in the church and people regularly end up in hospitals (if not the morgue) after religious brawls, beaten up for belonging to the wrong denomination, but as a tourist you should be safe. More wooden objects of worship. 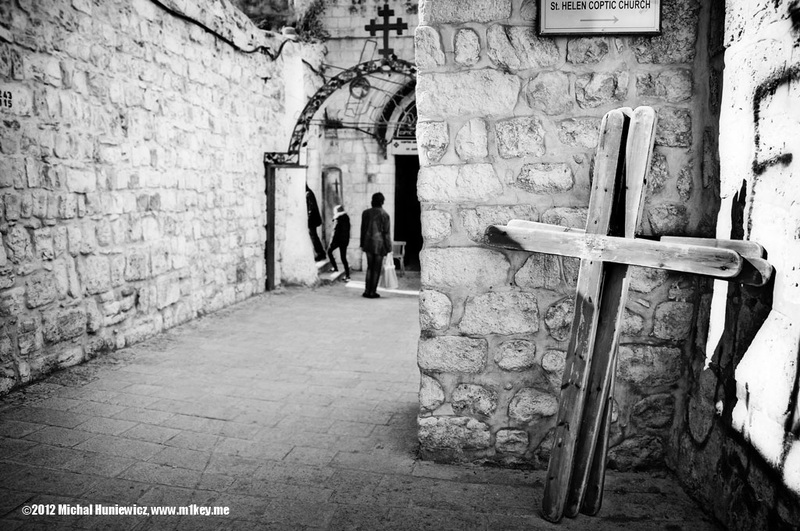 These are crosses rented by believers who want to walk the (probably not authentic) Via Dolorosa, following Jesus' footsteps to his crucifixion. If the cross is too heavy for you, you can rent one with a little wheel to drag it instead! Once in a while someone picks them up and returns to the renting place again. I tried, they're not very heavy, but then maybe it depends on the gravity of one's sins. The holiest place of Judaism, the Western Wall. Anyone can leave a note there by sticking it in the cracks of the wall. I did too, but rather than writing a wish I quoted my favourite philosopher. I wonder if anyone will read it. These are Israeli soldiers on a trip to Jerusalem. They are in the Jewish Quarter, which is the newest and the least authentic one (recently rebuilt), but also the cleanest and the freshest of the four. I had a chat there with three young female soldiers and I complimented them in Hebrew. I had memorised a few compliments in Hebrew and Arabic before coming to Israel (but I apparently messed up one of the Arabic ones and said 'Your eyes are very.'). Later I read about a German knight named Arnold von Harff, who in the 15th century visited Jerusalem also having learnt a few useful phrases in both Arabic and Hebrew, such as: 'Woman, let me sleep with you tonight' or 'Good madam, I am ALREADY in your bed'. The tradition continues! 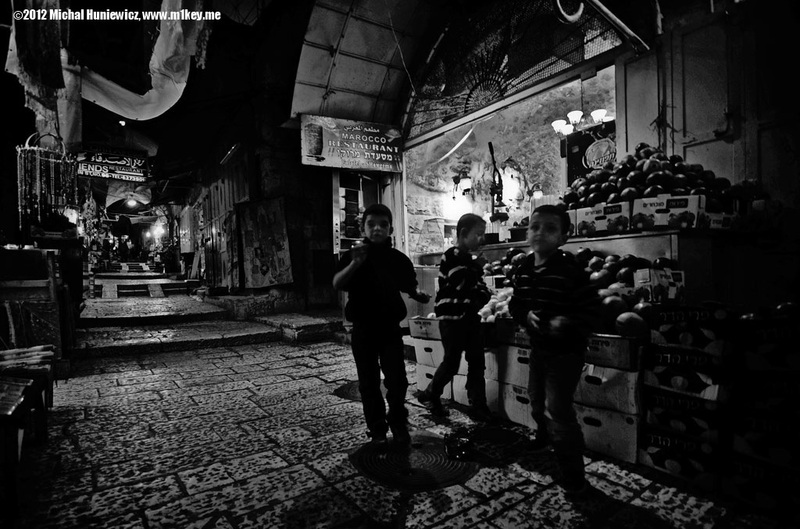 These are Arab kids - if you wander around the less popular areas of the Old City at night, they will assume you're lost and will offer you to guide you to any place you'd like. But not for free; you'll need to spare a few shekels. When I said I didn't need any help, they wouldn't go away and followed me like little zombies, and then when I repeated I didn't want help, they started hitting and kicking me in anger! Fresh fruits. Also, fresh juice is often available - and I do recommend it. This is the Yeusefiya Cemetery. I went there at night with a Jewish friend. We were stopped by Israeli soldiers, who demanded our documents. They asked where we were going and when we explained that we wanted to go to Jaffa Road via the Muslim Quarter, they switched to Hebrew and told my friend they needed us to go all around the Old City rather than through the Muslim neighbourhood, because they thought it was not safe for her to go there. They spotted a burning piece of wood on one of the tombs, investigated it with their rifles and then kicked into oblivion; I don't know what that piece of wood was. Then they gently escorted us out. It was a bit unusual to me, but you do feel they care about your safety. 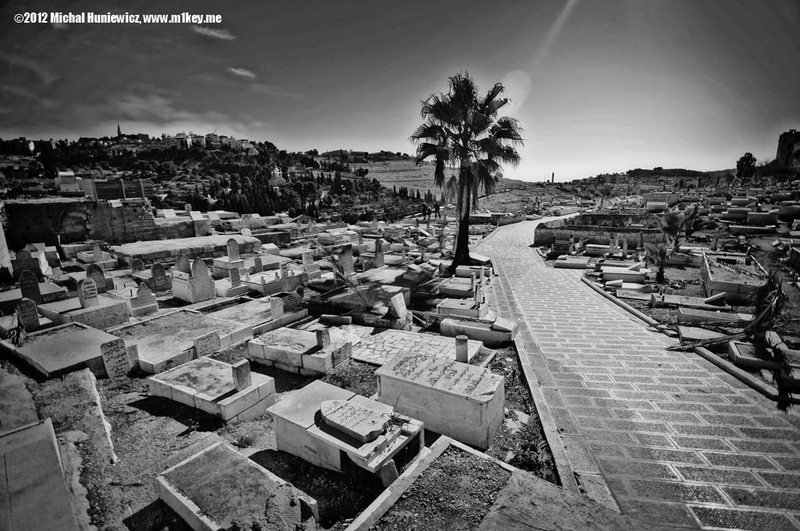 These are graves on the Mount of Olives. As you can see, the olive trees are now gone. The two big tombs are the Tomb of Benei Hezir (on the left) and the Tomb of Zechariah (on the right). The Tomb of Benei Hezir dates to the period of the Second Temple (2nd century BCE) and is a complex of burial caves. You might be able to recognise Greek influence (the columns). According to the Christian tradition, this is roughly where Jesus appeared to the apostle Saint James. The Tomb of Zechariah on the other hand, is a monolith, meaning it's solid rock and there's no burial chamber. The cornice is in the Egyptian style, while the columns are in the Greek style. 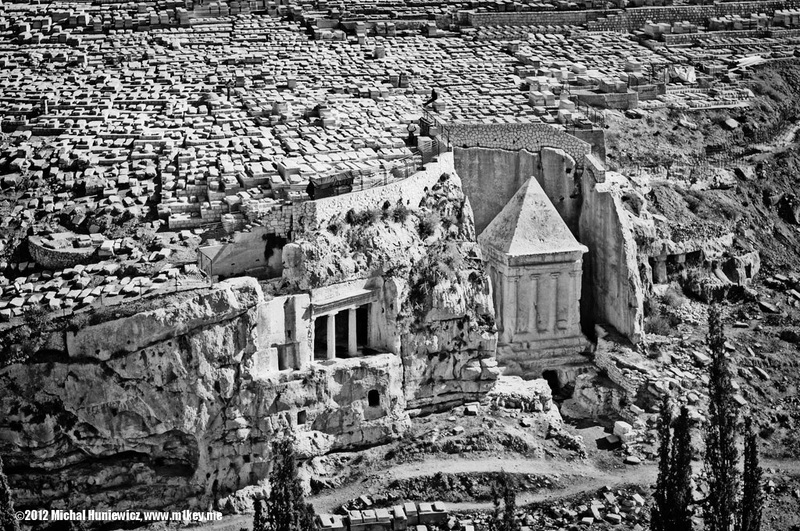 The role of the tomb might be simply a funerary monument to the Benei Hezir tomb, rather than being a tomb of its own. I like the architectural melting pot Jerusalem is. "As a mother comforts her child, so will I comfort you; and you will be comforted over Jerusalem. ", Isaiah 66:13. 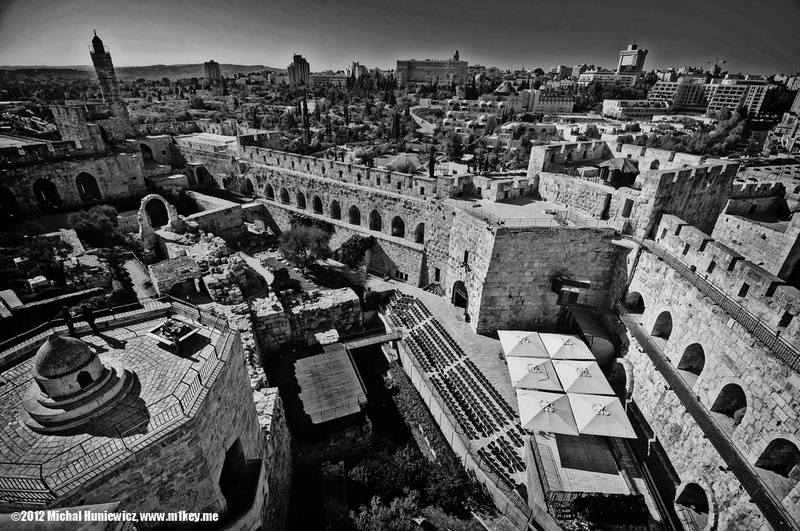 This is the Tower of David - and that's one thing it's not. It's Byzantine Christians who gave it this name but they got it wrong. It's a citadel built in a weak point of Jerusalem's defenses. Herod the Great enhanced this citadel by adding massive towers. Today it's a great place to visit and it has many stories to tell. The funny thing about Jerusalem is that people generally dislike Herod the Great there and portray him as an evil madman. I'm not a Herod revisionist but I couldn't help but notice that Herod contributed a lot to Jerusalem and the kingdom of Judea. He is the one who built the Second Temple and the port of Caesarea Maritima. It's true that he killed many members of his family, but the Massacre of the Innocents described in the Bible, like many other biblical events, never actually took place. 'Phoenician by descent, Hellenised by culture, Idumean by place of birth, Jewish by religion, Jerusalemite by Residence, and Roman by citizenship', he is surely a fascinating figure to this day. 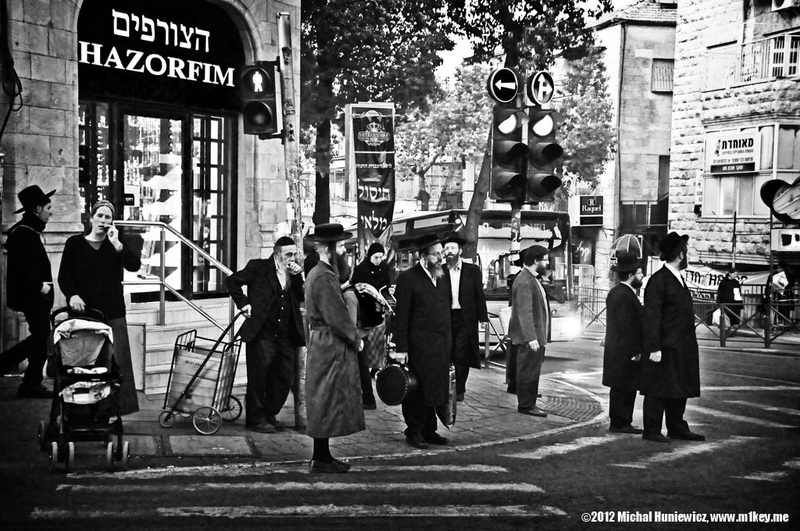 This is not Brent Cross, this is Mea Shearim in Jerusalem (ha ha). 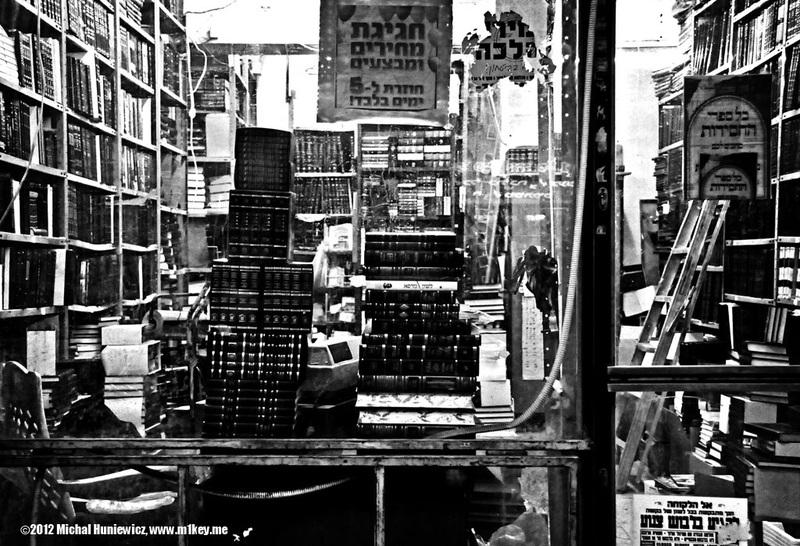 Mea Shearim was an unpleasant place when I visited. Inhabited by ultra orthodox Jews, this neighbourhood is definitely not welcoming. It doesn't matter who you are or what you look like - if you're not an orthodox Jew, you're an intruder and you're treated as such. They leer at you with hostility and sometimes warn you with a violent gesture not to use your camera. 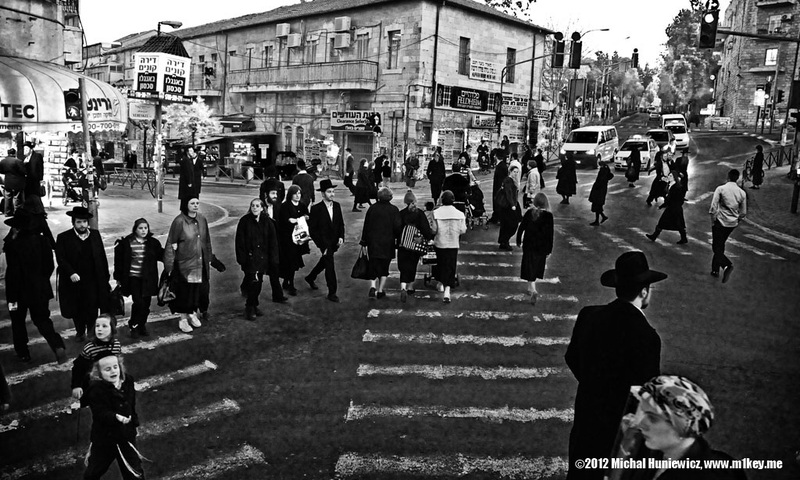 This is the main street crossing in Mea Shearim. To my surprise it resembled the famous Tokyo's crossing called Shibuya. I didn't buy anything here; but in a local bakery I found out that I would still be served, even though I obviously didn't belong. Look at all those holy men. Maybe you are holy too? 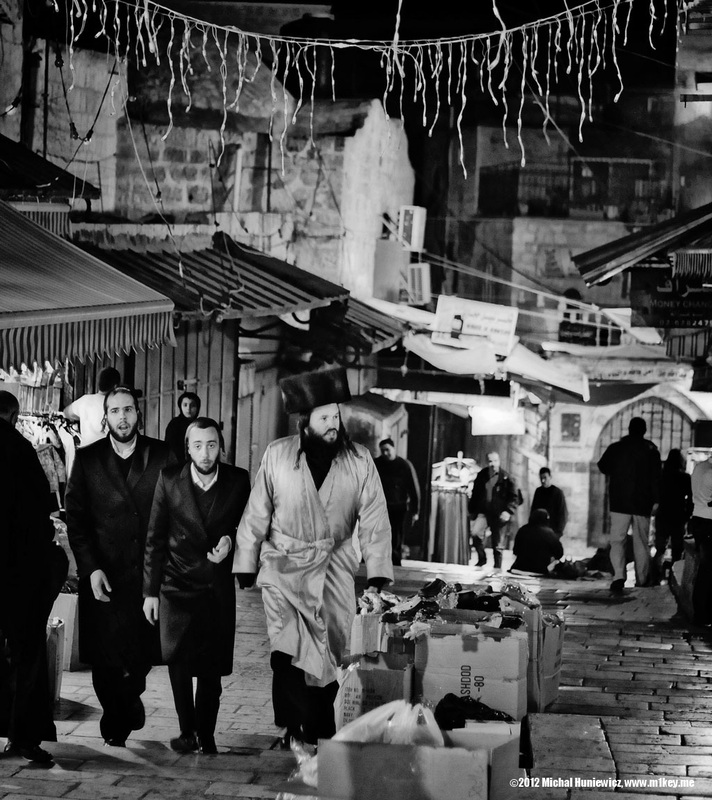 Many people who come to Jerusalem begin to suffer from what is known as the Jerusalem syndrome. They believe they are Jesus. Or King David. Or King Salomon. Or Mary Magdalene. When I whispered into a just-met girl's ear that I was the Messiah, she was only slightly surprised. As it turns out, in the Jerusalem hospital there's a ward for people with this syndrome! Jerusalem is not the only city to have its own syndrome. So do Paris and Florence. 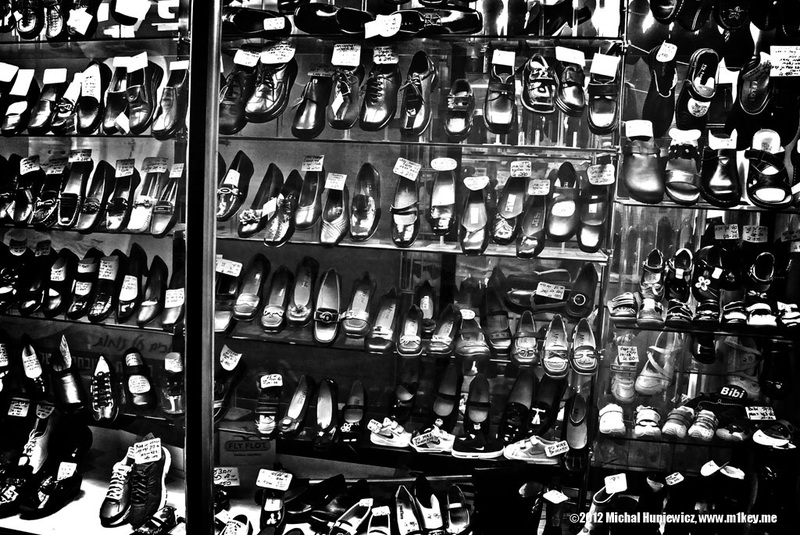 You can buy shoes in any colour - as long as it's black. It's not that bad now, of course, but it's not at all a nice place and they are often poor. 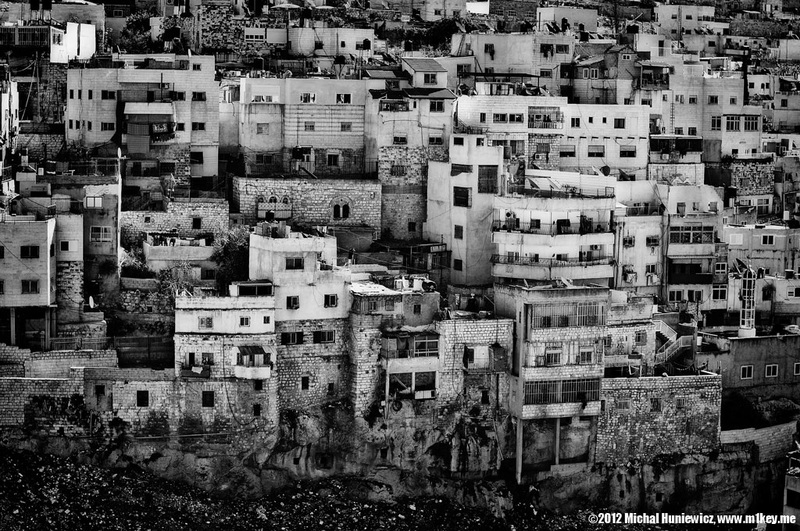 This is the Palestinian neighbourhood of Silwan. Notice the ancient tombs at the base of the buildings. It sometimes happens that Israeli scientists perform excavations which damage the houses - but Israel considers many of the houses illegal in the first place. 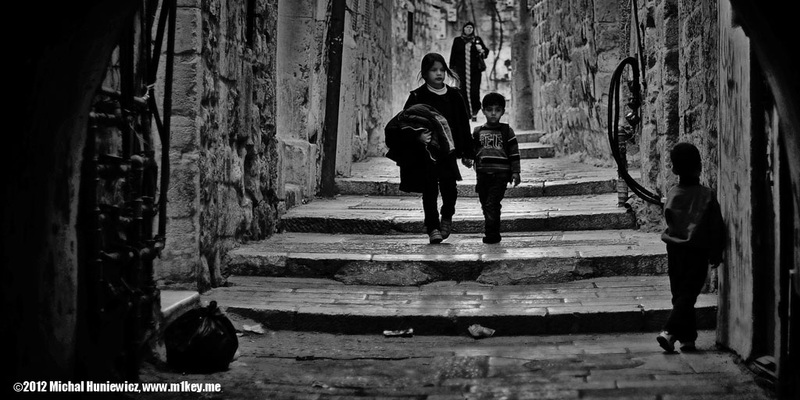 The Arabs accuse the Jews of deliberately performing archeological works to disturb the life of the Arab society in Silwan. Even though there's a lot of tension there, I must admit Jerusalem is a beautiful place. Here you can see the Dome of the Rock (on the left) and the Mount Of Olives (in the back, right); and the Armenian Quarter (on the right). The Armenian Quarter is probably the most mysterious one as they don't really let you in. As a side note, the Armenian Quarter is where the famous Roman Tenth Legion had its headquarters. 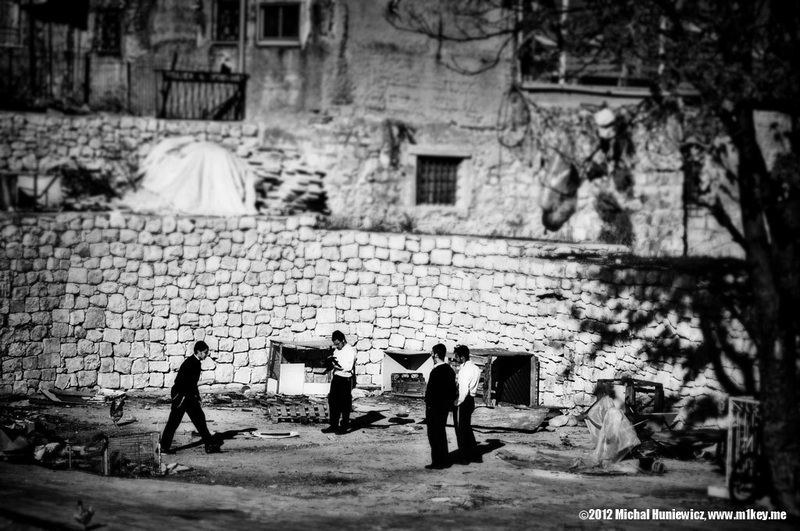 These are Jews near the Damascus Gate, in the Muslim Quarter. They use that gate because it's the quickest way to the Wailing Wall. They usually rush without looking around, just staring at their feet and ignoring the surroundings, but these three were an exception. This particular place is a great opportunity to observe the delicate peace and tolerance (as opposed to acceptance) that characterises the whole of Jerusalem. There's one thing that I noticed about Jerusalem. Most Christian, Jewish or Muslims organised trips focused on their own sites. They don't really go to competing religions' places. 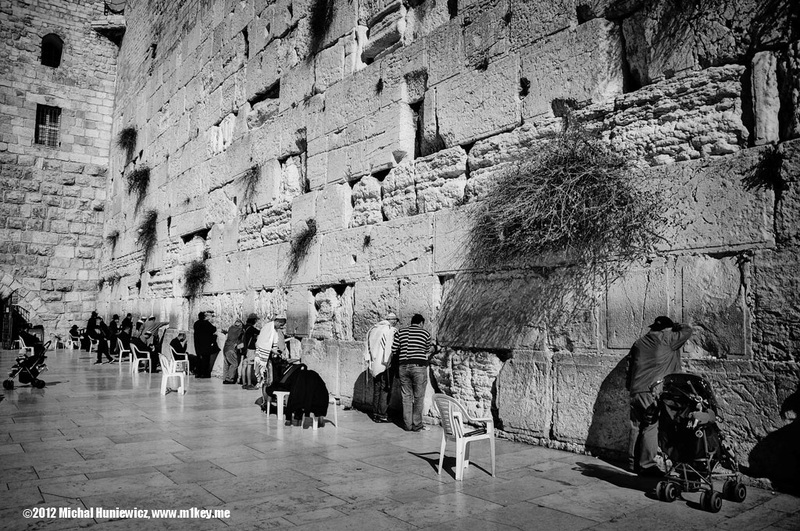 If you restrict yourself in a similar manner, the trip to Jerusalem may reinforce your faith. But if your eyes are open and if you go to all three religions' holy sites and talk to people there, it will surely strike you at to how incredibly confident they are of their own mutually exclusive beliefs. Their arrogance, pride, and haughtiness is at times almost stunning. They truly believe they are superior to everyone else, that they know the truth while other people are led astray. That's how they live in their bubble. As for my experience, not that I expected anything extraordinary, I didn't really feel spiritual anywhere in Jerusalem. Even when years ago I made it to a place where Ulysses was supposed to have been travelling, I was impressed. Of course, I don't believe in the Greek mythology, but still it was an almost indelible experience... Yet somehow nothing like that happened to me in Jerusalem, which was disappointing. I thought that after years of indoctrination I would at least think "Wow, so it was supposed to happen here!" I felt a little ostracised at first but I met other godless people with whom I hung out watching and grinning at the often grotesque if not Monty Pythonian reality of Jerusalem. It's not a place of love. On the contrary, it's a place where mere gossip often leads to hostility and death, such as in 1996 when it was suggested that the Israelis wanted to excavate and undermine the Islamic Sanctuary, which led to 75 deaths. But it is precisely this clash of cultures and beliefs, if not civilisations, that makes it such an incredibly fascinating place. 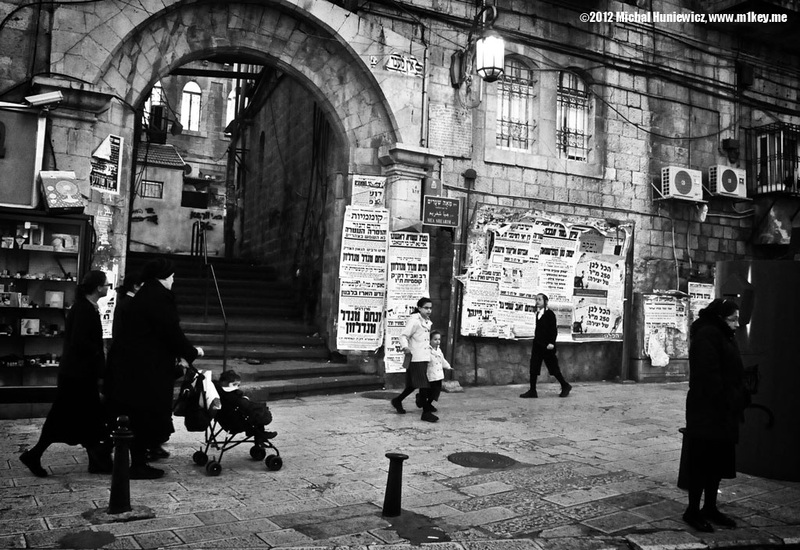 As Simon Sebag Montefiore put it, today Jerusalem lives in a state of schizophrenic anxiety. 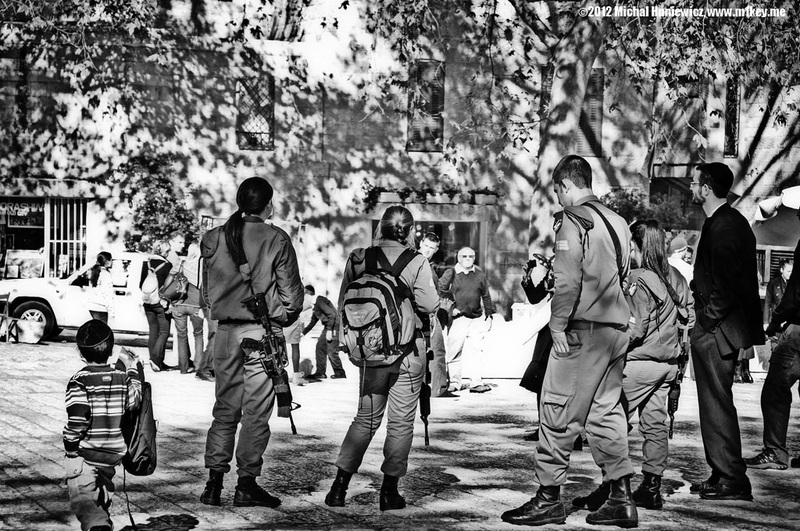 Messianic Jews tease the Muslims and try to enter their holy sites, Christian sects keep fighting one another, the Muslims hate the Jews, and liberal Jews risk stoning from orthodox Jews. 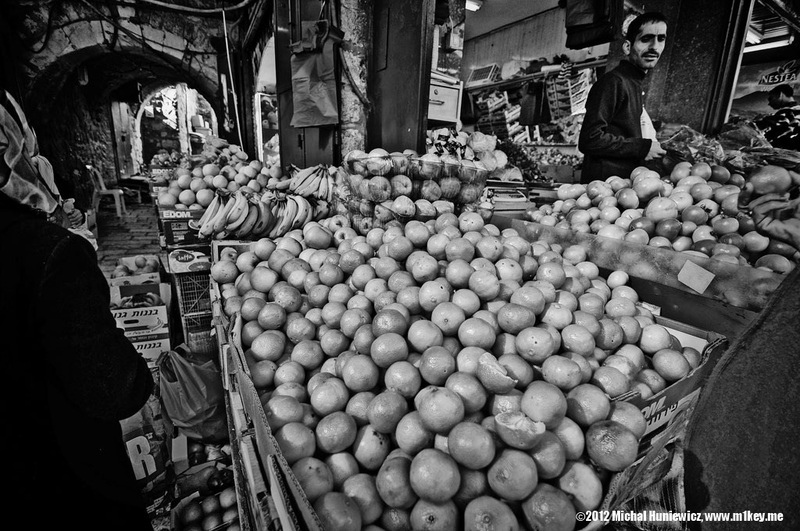 The Jewish girl I met in Jerusalem had never even been to the Muslim quarter before venturing there with me. 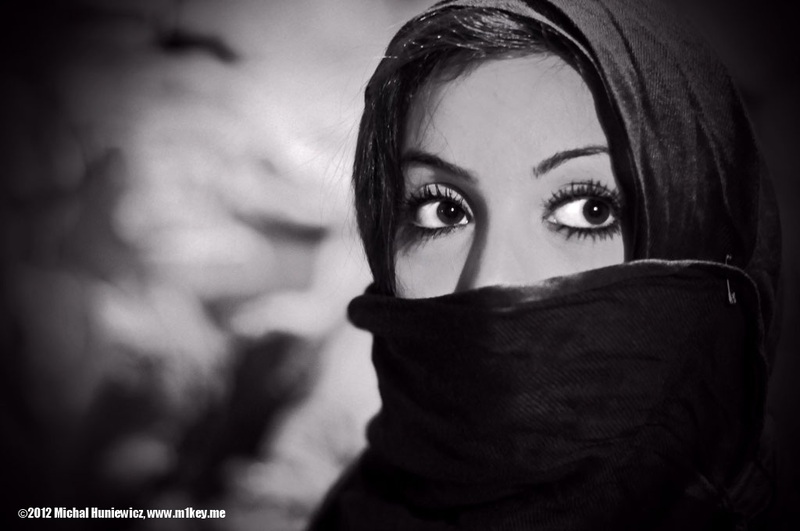 The Muslim girl I met in Jerusalem was reluctant to visit the Jewish sites but dared to, under my 'protection'. In both cases nothing bad happened. Will the troubled Jerusalem at last become a place where you first get stoned and then commit adultery - rather than the other way round? Only time will tell.